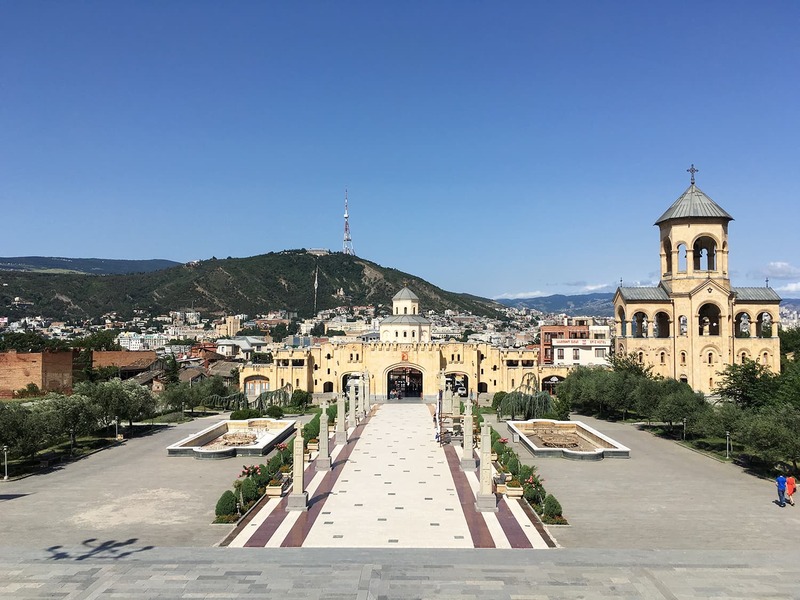 “The best way to see Tbilisi is to walk,” Irakli, the owner of a cosy B&B in Old Tbilisi, shared this tip on our first day in the city, while handing us a map and completely dismissing the use of public transportation. 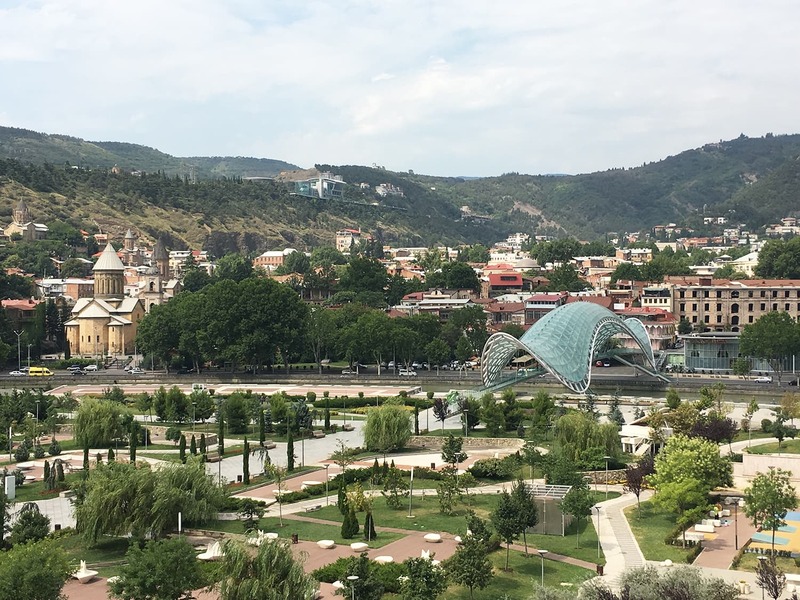 Tbilisi — the capital of Georgia — is a hilly city, divided into two parts by the Mtkvari River. The country is located at the intersection of Eastern Europe and West Asia. As a Pakistani now living in the UAE on a resident visa, I was given a visa on arrival to Georgia. 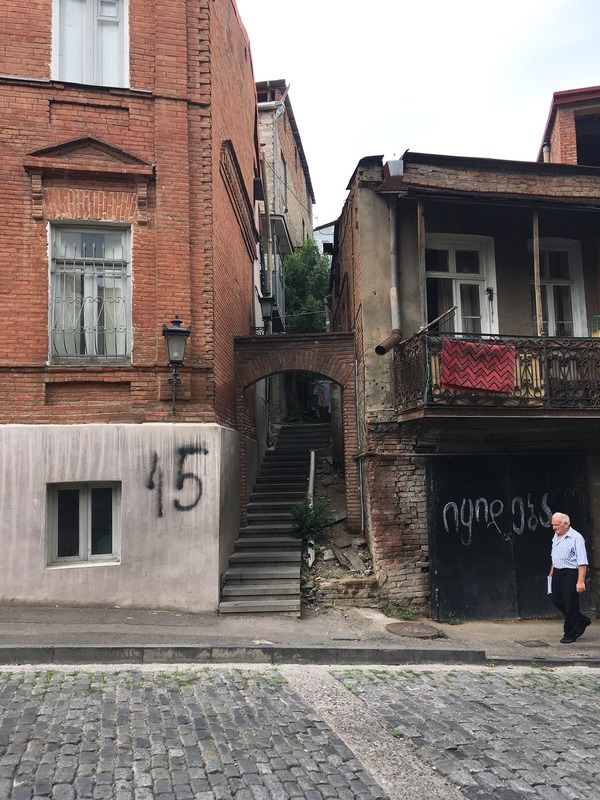 On a three-day sojourn in Tbilisi, we (my friend and I) were staying on the left bank in Avlabari, a quiet neighbourhood of the Old Town, close to the looming Sameba Cathedral. Mother Georgia looking over the Old Town. The old neighbourhood of Avlabari. A park of the Metekhi Church on the Mtkvari River. Old Tbilisi extends all the way to the right bank, where the Mother of Georgia, an aluminium figure holding wine in one hand and a sword in the other, watches over the bustling district. A number of bridges connect the two sides, among which is the Baratashvili Bridge, which led me and my friend to direction signs, all pointing to names we couldn’t find on the map. Making out the word ‘theatre’, we followed one of the arrows into a narrow lane next to the plush Hotel Ambasadori. 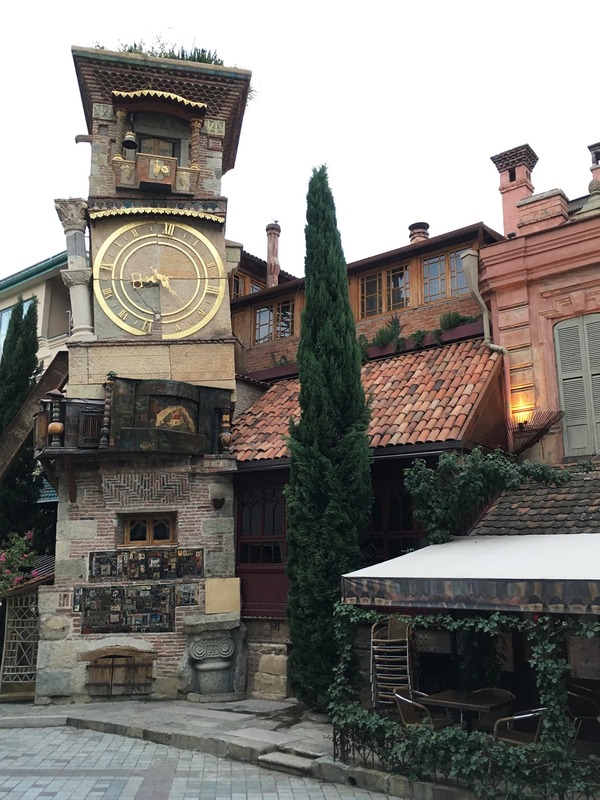 There, in the midst of the small alleys, stood a crooked clock tower by noted Georgian puppeteer Revaz “Rezo” Levanovich Gabriadze. 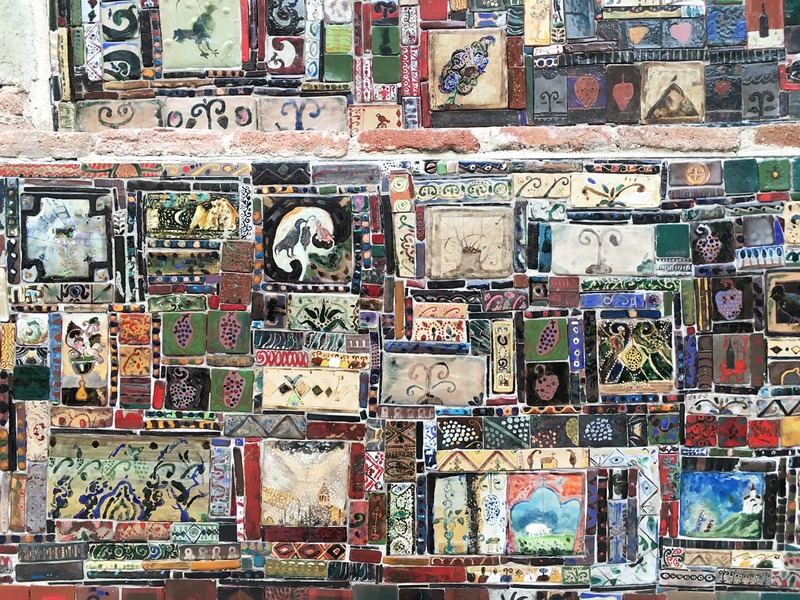 Resembling something out of Alice in Wonderland, the tower is covered with hundreds of intricate and colourful tiles designed by Rezo himself, who is also a famed writer, director, and artist. The clock tower by Rezo is made to appear as if it is on the brink of falling down. Colourful tiles designed by puppeteer Rezo adorn the clock. At the back of the tower is the Gabriadze Puppet Theatre, founded in 1981, and to its right is a namesake café, also decorated by Rezo that serves traditional Georgian food. 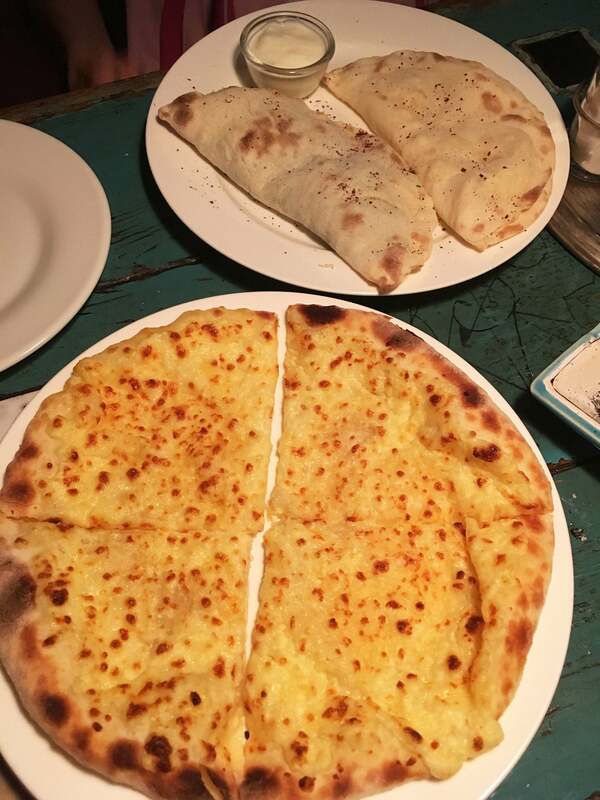 We sat in the cafe’s summer terrace, gorging on the famous Georgian cheese-filled bread, khachapuri, while waiting for the tower’s angel to ring the bell with a small hammer. A few steps ahead of the theatre, we came across the Anchiskhati Basilica, the oldest surviving church (built in the 6th century) in the city. Two things can be found in abundance in Tbilisi: old churches and homemade wine. The latter is offered generously as a sign of hospitality. 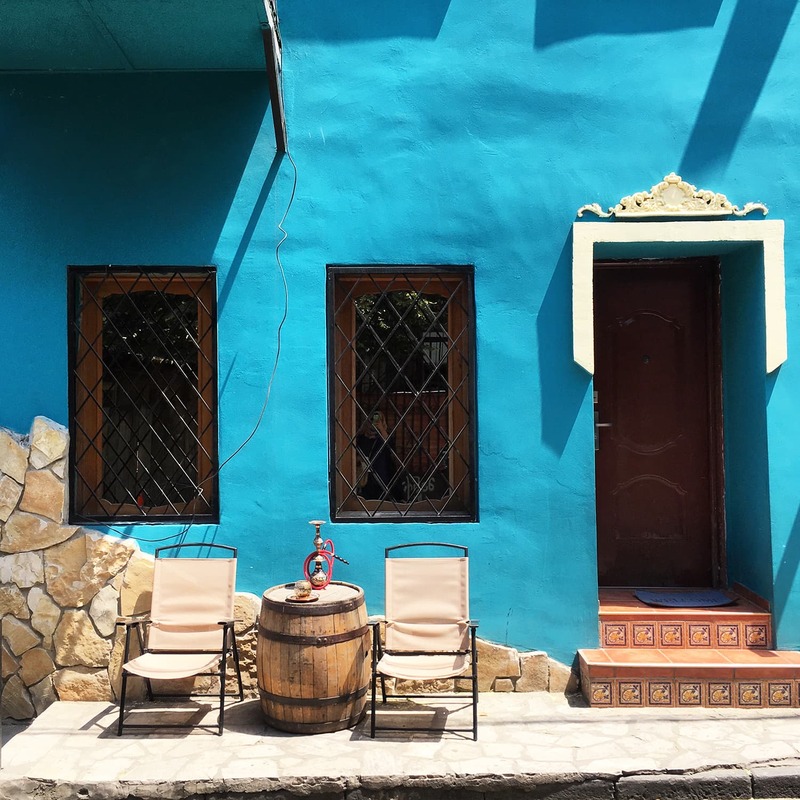 The city is deeply rooted in religion (Eastern Orthodox Christian) and the centuries-old churches still function more as a place of worship than a tourist attraction. 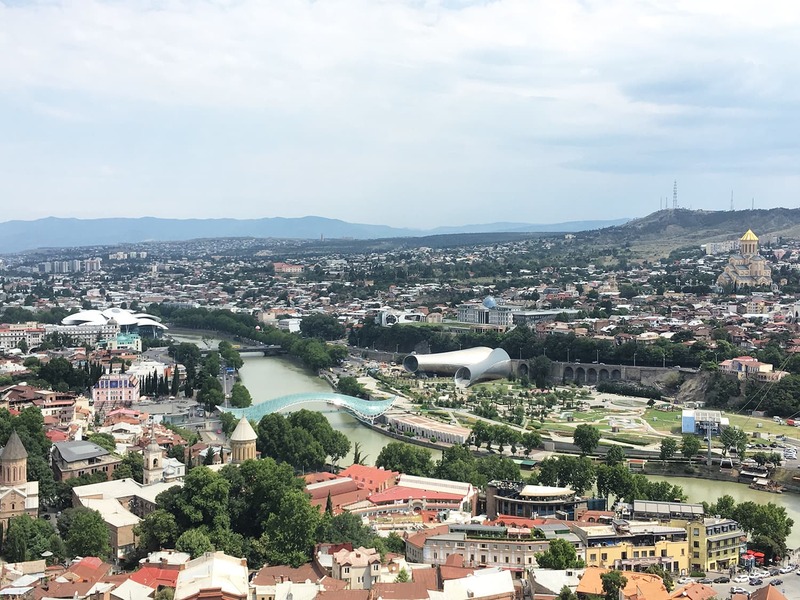 On the second day of our trip, we were pretty sure we’d taken a wrong turn — several actually — as we made our way through Old Tbilisi. By midday, we had already seen the ancient Narikala Fortess (the cable car from Rike Park took us up the hill) and were now aimlessly wandering through a labyrinth of twisting streets — easily the best way to explore the city. A view from the Narikala Fortress. 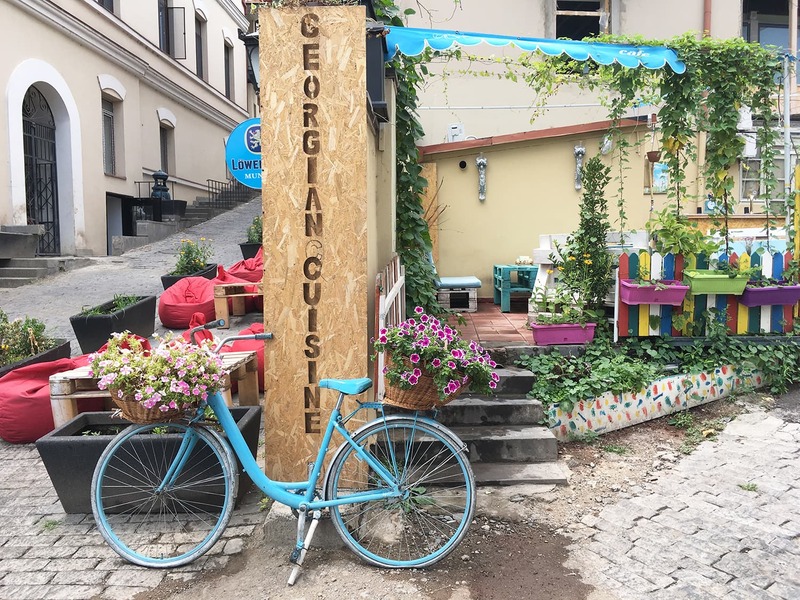 Years of invasions and civil war have left parts of Tbilisi in a dishevelled state, but as we walked through the Old Town, I found a disordered charm in its colourful houses, wrought iron gates and peering balconies. The Bridge of Peace connects the left and right banks. 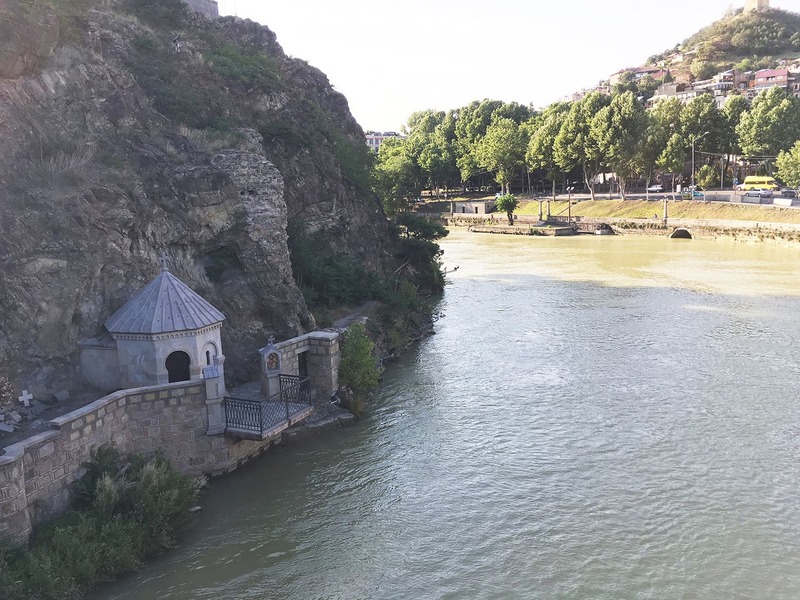 Along the way, we passed by the Sulfur Baths, the Bridge of Peace and upon arriving at the Sioni Cathedral, we finally opened up our maps to start on the agenda for the day: café hopping. 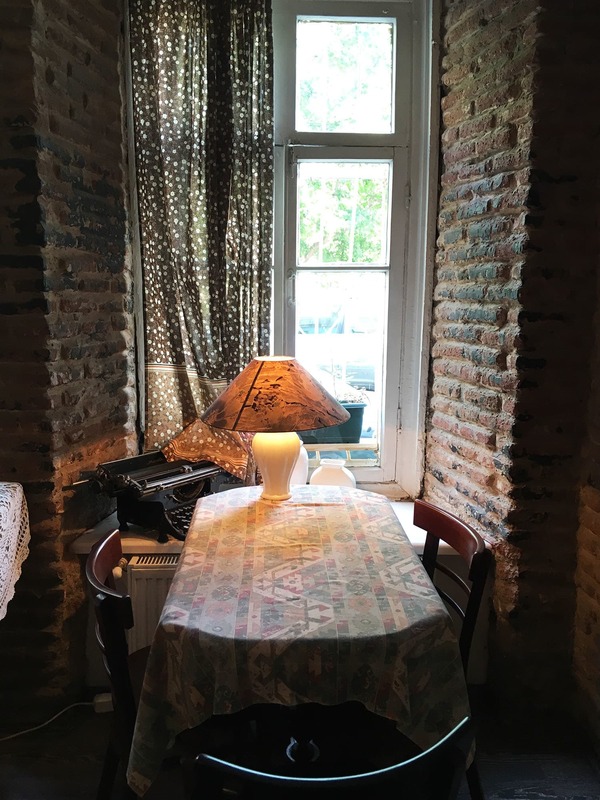 Tbilisi has some of the most unique art and vintage cafés, so we made it a mission to visit as many as we could. Most of these were obscure venues, but worth seeking out. 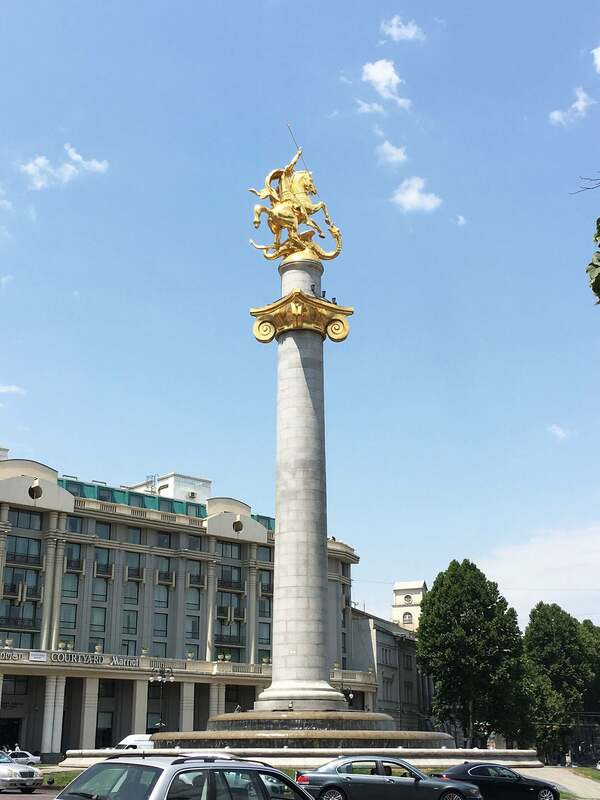 St. George Monument at Freedom Square. Reaching Freedom Square — where a monument of St. George slaying the dragon now stands in place of Vladimir Lenin’s statue — was easy. 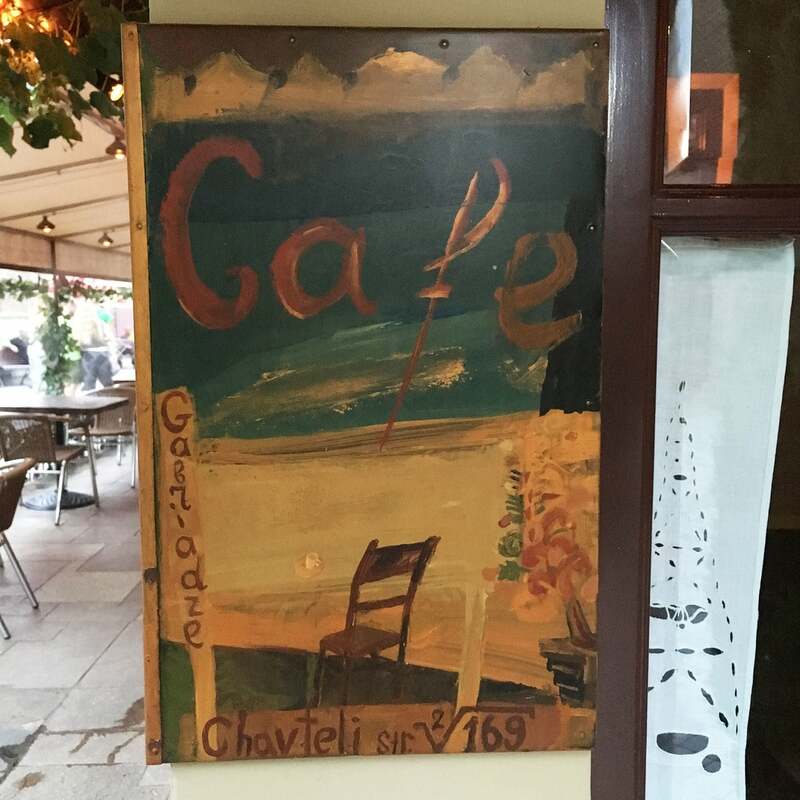 Finding the artsy, vintage Café Linville, however, was a challenge. 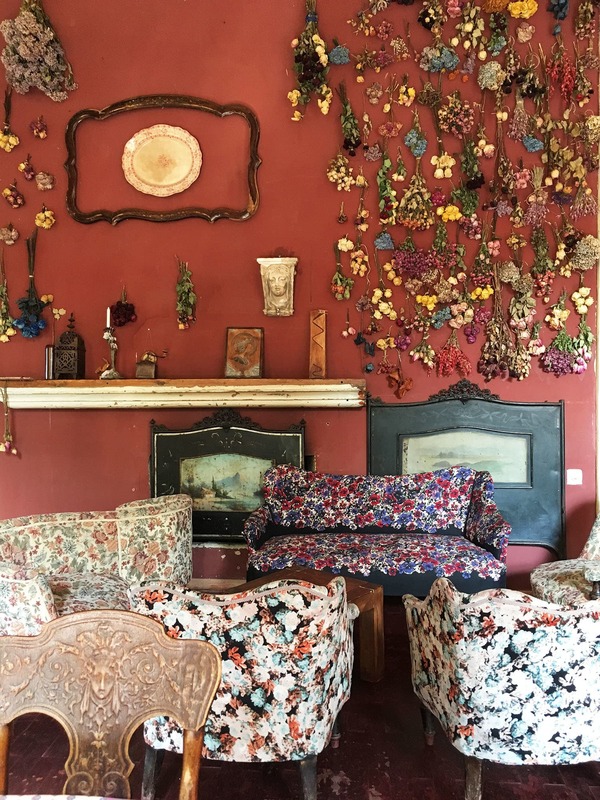 Inside the café, the delicate tablecloths, old-fashioned lamps, velvet couches, old photographs, an antique piano and floral wallpaper create a nostalgic atmosphere. From there, with the help of WiFi and Google Maps, we stopped at the secluded, picturesque Amo Rame Art Café for lunch (the quattro formaggi pizza is highly recommended — Georgians really know their cheese). Bohemian decor at Pur Pur cafe. For dessert, we settled into rocking chairs on the balcony of the bohemian-esque Pur Pur café and splurged on homemade nutty ice cream. Cafe Littera at the Writer’s House of Georgia. The Writer’s House of Georgia was next on the cards, a beautiful piece of Art Nouveau architecture, built in the early 1900s. 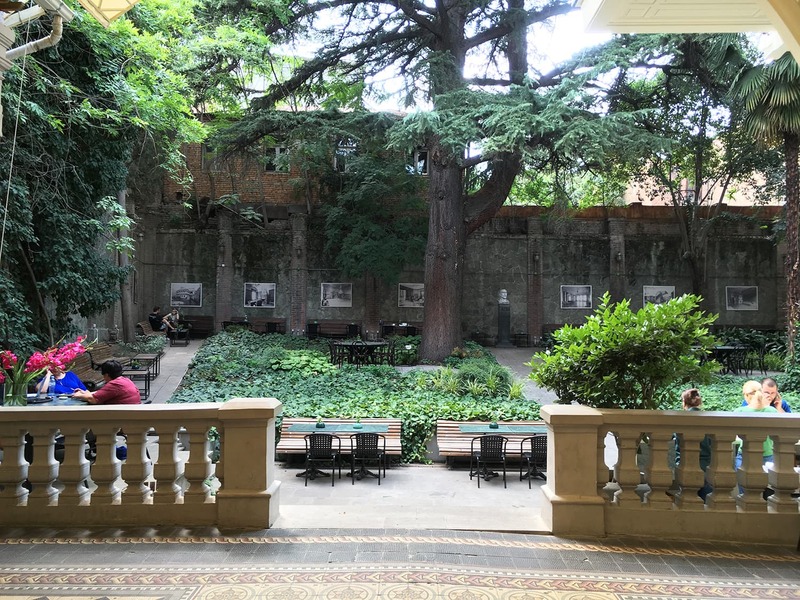 Dedicated to protecting and promoting Georgian art and literature, the house has turned its lush courtyard garden into a café — a place where friends lose track of time over several cups of coffee under an enormous pine tree. We idled there for a long time and found it genuinely blissful. 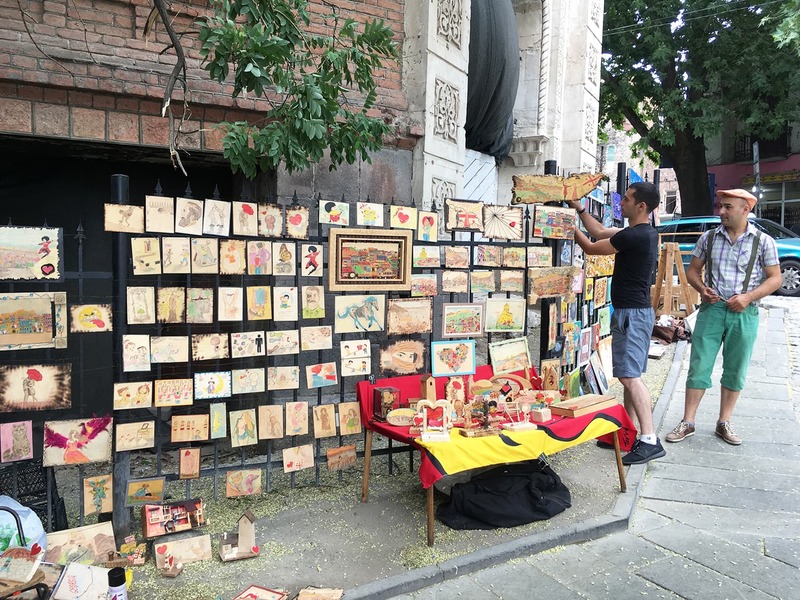 Rustaveli Avenue in Tbilisi is often likened to Paris’ glittering Champs Élysées, and while that is a hyperbole, the 1.5km thoroughfare is undoubtedly the more fashionable and commercial part of the city. Starting at Freedom Square, the avenue is dotted with famous buildings: Rustaveli Cinema, former Parliament Building of Georgia, Art House of Tbilisi and the Art Museum, Tbilisi Opera House, and the Rustaveli Theatre. The Tbilisi Literature Museum is nearby and in its courtyard is Sofia Melnikova’s Fantastic Douqan, a locals’ favourite restaurant (plus a small boutique) hidden from the view where we tried the juicy Georgian dumplingskhinkali on our third and last day. The Dry Bridge Flea Market. 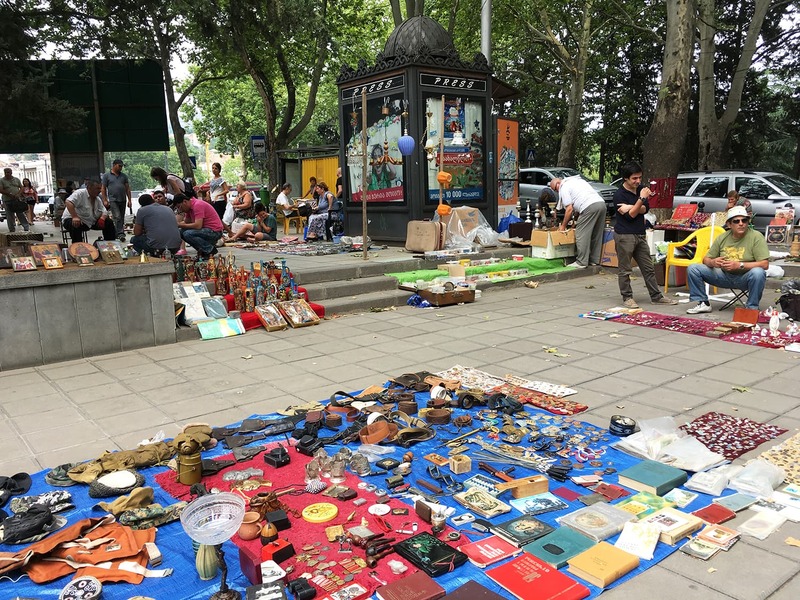 There are plenty of shops around the city but for the most eclectic mix of items, head to the riverside, where the Dry Bridge Flea Market is set up. From jewellery to medals and even old toothbrushes, we found the most random objects on sale. Just know that when you ask people about ‘Dry Bridge’, you’ll only get quizzical looks in return and there’s no mention of it on maps — but it does exist, so persevere and look out for colourful paintings hanging on the walls. Although Georgians live up to their hospitable and friendly reputation, language is a barrier and hand gestures can only get you so far. 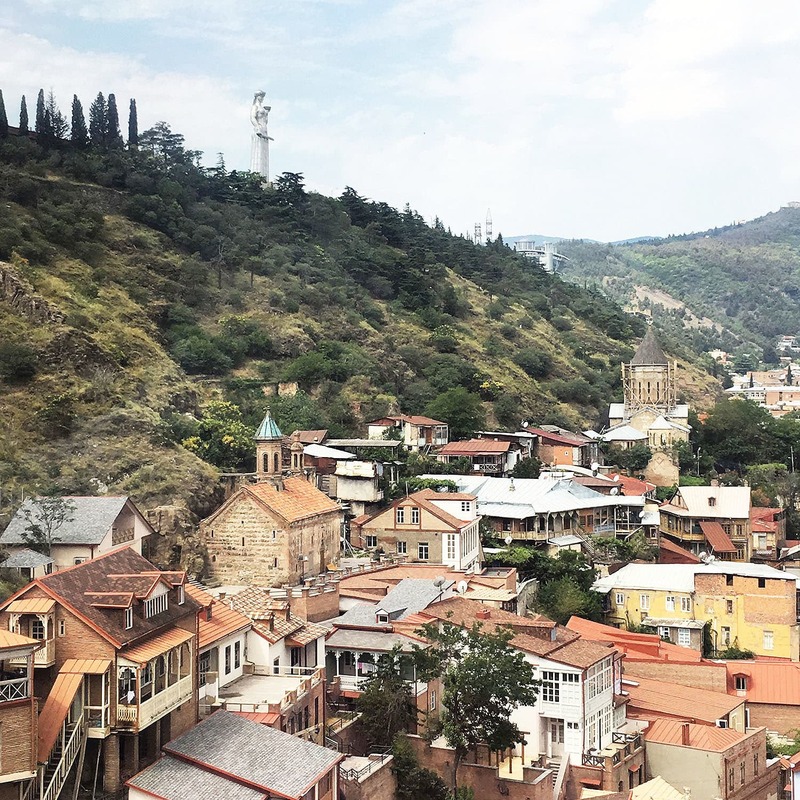 Taking a break from the maze-like cobblestone streets of Tbilisi, in the evening we took the funicular railway to Mount Mtatsminda, where the map in my pocket came to life in the form of a stunning panoramic view of the city. And that’s the only map you should dwell on when in Tbilisi.